Last Thanksgiving, Mr. J and I decided to eschew expected traditions and set off on a very spontaneous trip that involved going south for the weekend. We invited Hammie along but he said he had some elbow rubbing to do at his parents' Thanksgiving dinner party at the Hamstons. I wasn't even aware that he was so well-connected; that surely explained his good taste with the whole "hamsters of the same fur, smoosh together" sort of bit. We decided to go on the Friday, booked the hotel on Saturday and left on Sunday. Yeah, we're crazy like that. ;) Good thing the gorgeous weather held up all throughout and made the drive easy. We left at awkward hours too, so we didn't really encounter any traffic to and fro. Lucky for us, Columbus Day sales coincided with the long weekend so of course we did a spot of shopping! We also did the drugstore rounds in hopes of finding products I'd seen on blogs that haven't yet made their way up north. In this, self control was a must! I didn't want to pay high border duties and since we stayed overnight, we were allowed at least $50 worth of un-taxable shopping for each of us so I had to make sure I stayed well under $50. But that's enough rambling and on with the show! My first Butter London triplets. Wee! Project Runway inspired polish and duochrome glitter. Two (Salma Hayek's Nuance) pods and a (NYX) lippy. I was very pleased with these. 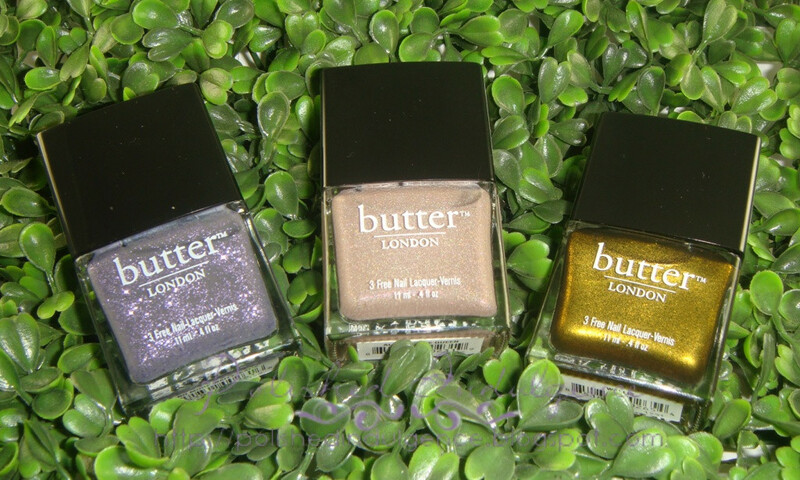 The Butter London polishes were on sale, buy 2 get 1 free! I ended up paying only about $9 for each. Well within my self-imposed per bottle price tag limit of $10. It was so hard to choose just three! Bluey was begging to come home with me, too. *cries* I shall return, Bluey..! The Scherer polishes were a very pleasant surprise! I didn't know you could get duochromes at the drugstore. I was always under the impression that they were usually hard to find. If only they'd travel further up north though.. We'll have to see how good these chameleons are in the coming posts. I picked up the $2 Confetti polish because it was blue glitter. And the name made me giggle: Ice Ice Baby. Little did I know that it was also a duochrome! I did a nail wheel swatch and it shifts from teal to blue. Gorgeous. My only regret? That I didn't get more of those glitters! The L'Oreal polish was limited edition from the Project Runway collection so you know I had to get it. It was the one that caught my eye the most. The rest were easily dupe-able so I skipped out on the others. Can't wait to put this one on! I've been wanting to swatch these since I got them but the sun's on vacay and I'm fairly certain the sunlight photos for these will be gorgeous and do them more justice. So I'm torn between just going ahead with it and just updating the posts with the sunlight photos when the sun finally shows its face again. What do you think? Would you want to see swatches and reviews on the makeup, too? Any here that you'd love to see first? 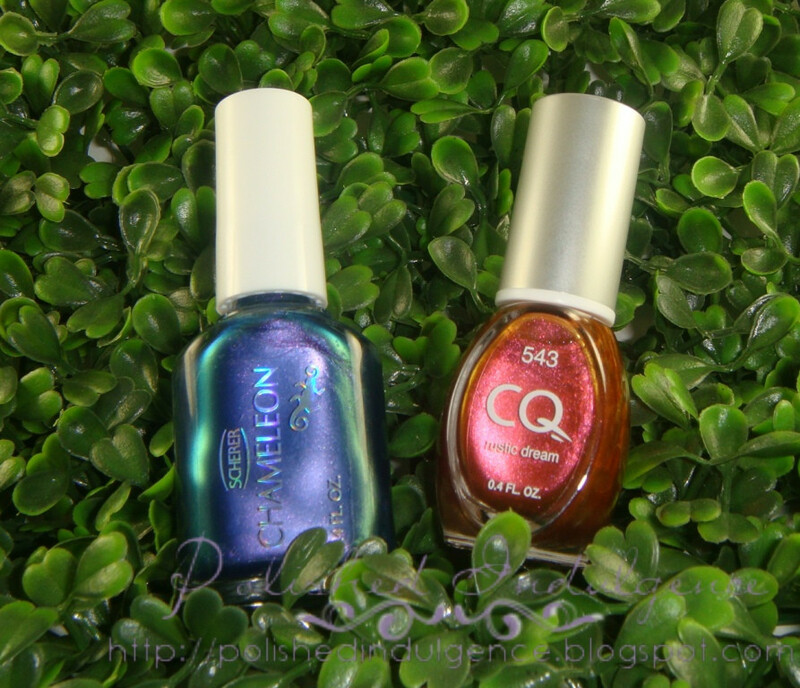 Posted by Carmela at 8:30 a.m.
Swatch And Learn October 18, 2011 at 5:18 p.m.
Great deal on the Butter London polishes! I recently picked up Wallis, too. I mean, it's a must-buy when you see it in person. I'm curious to see your take on No More Waitey Katie. That looks gorgeous, and I'm especially excited to see if you decide to layer it. I'd be interested in seeing your swatches and review of the lip and eye quad pods. They look like they'd be fun to play with because of their unique shape, too! Carmela October 18, 2011 at 7:35 p.m. I didn't need to see it in person to have Wallis on a must buy list. ;) I probably could have (should have?) bought 3 other Butter London polishes but I had to restrain myself. I've been impatiently waiting for the sun to come out so I can properly swatch these! I've been experimenting and trying to find a lighting solution for swatching so that I don't have to keep relying on great weather for awesome photos but it's still a lot of trial and error. Any suggestions? Get your first Julep Maven box for a penny with code: PENNY at checkout! Win a Premier Spa Boutique Nail Care Kit from Beauty Crazed in Canada! Win Dior, EOS, L'Oreal and More from Beauty Crazed in Canada! Free samples of bath/shower gel and body butter from Find Your Bliss! 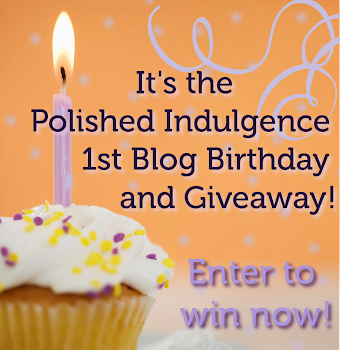 Meet Hammie, the Polished Indulgence Blog Mascot! Indulge with Us via Email! Color Club Revvvolution = Happy Holo-ween! OPI Movin' Out and Happy (Canadian) Thanksgiving! A Quick Thank You and Preview Post!